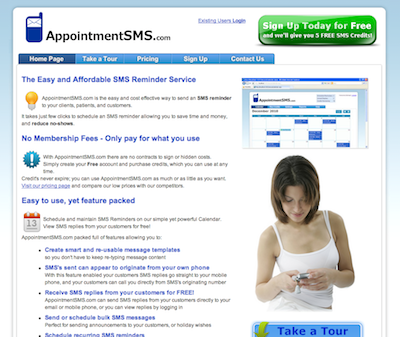 AppointmentSMS.com lets businesses save time and money by scheduling SMS appointment reminders for their patients and customers. SMS appointment reminders drastically reduce costly no-shows, making AppointmentSMS.com an invaluable tool to any business that schedules appointments for customers/patients. AppointmentSMS.com has been developed using the latest web 2.0 technologies, making it much more intuitive and easy to use than other SMS scheduling software. This saves users time by allowing them to schedule SMS reminders quickly and easily. AppointmentSMS.com has many useful features that are missing from competitor’s sites, such as the ability to receive SMS replies free of charge.